A teenage boy was arrested on suspicion of behaving indecently towards a woman in Crawley. Police said the incident happened at 9.30am last Thursday (November 9), in playing fields in Northgate, when a man was seen acting indecently. A woman passer-by had reportedly challenged him, and he shouted at her before running off and driving away in a car. A Sussex Police spokesman said: “A 16-year-old boy from Crawley was arrested on November 11, on suspicion of outraging public decency in relation to the incident on November 9. 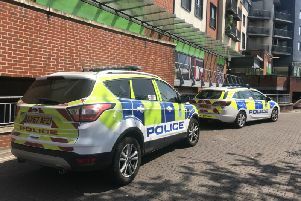 Officers are investigating another three cases of indecent behaviour towards women in Crawley in the past three months. At 2.30am on August 26, a Broadfield resident heard tapping on her window, and saw a man right outside it, committing an indecent act before running away, said police. At 7.50pm on October 9, at a Goffs Park address, another woman heard tapping at her window and saw a man right outside, again acting indecently. Police said a man had been arrested following the incident and released under investigation. At 1.45pm on October 29, a man reportedly exposed himself to a woman walking through a wooded area in Northgate. Investigator Dave Bell said: “It is possible that the same person is responsible for several if not all four incidents, although we cannot confirm that at this stage. “They certainly caused great distress and offence to the women, and we need to find whoever is responsible. Police said the case of indecent exposure at the Goffs Park address on October 9, is not being linked to the other three incidents.